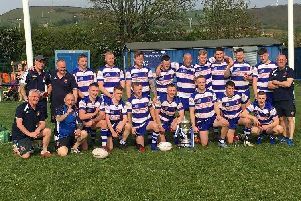 THE Halifax-Huddersfield Union senior side nailed down the runners-up berth in the Yorkshire Inter-District League in style yesterday. A draw would have been enough against Teesside at Meltham but Frank Greaves’s side made it six wins on the bounce with an emphatic 25-11 success. Unbeaten Sheffield, who got the better of Halifax-Huddersfield in the opener, were uncatchable before yesterday due to the margins of their previous successes this year. The hosts were 9-3 up after the foursomes and the all-important 18th point was sealed by Tom Hunt, when he reached 2 up with two to play. By that stage Josh Morton, Aaron Schnacke, Tom Calvert and Scott Minto had already won their singles contests. Lightcliffe’s Matthew Holden, the fourth junior to play for the team this year, won his match and fellow youngster Harry Mowl, from Crow Nest Park, snatched a half with the help of a fantastic approach shot at the last. Mowl and fellow junior James Edwards, who was an easy singles winner, were awarded their Union ties for playing six senior matches. The season is completed next weekend by the 45th Team Championship at Knaresborough. Scores (Hx-Hudds names first) - Foursomes: J Morton & T Hunt bt T Harbord & J Trewitt 5&3, A Schnacke & T Calvert bt W Skipp & M Dowdall 4&3, H Mowl & J Edwards bt M Hay & A Gray 3&1, G McLean & S Minto Lost to L Bond & L Marr 3&2, C Lander & M Colcombe bt J Elliott & R Elliott 4&3, M Holden & M Birkett finished all square with W Melles & I Graham. Singles: Morton (Hudds) bt Harbord 2&1, Schnacke (Hudds) bt Trewitt 2&1, Hunt (Mletham) bt Skipp 1 up, Calvert (Hudds) by Dowdall 5&3, Birkett (Halifax) lost to Hay 2&1, Minto (Hanging Heaton) bt Gray 4&3, McLean (Meltham) finished all square with Bond, Holden (Lightcliffe) bt Marr 1 up, Colcombe (Longley Park) lost to R Elliott 1 down, Mowl (Crow Nest Park) finished all square with J Elliott, Lander (Bradley Hall) lost to Melles 1 down, Edwards (Hudds) by Graham 6&5.